The kilogram is changing. Weight, what? A replica of the International Prototype Kilogram at the International Bureau of Weights and Measures, in Sevres, France. The golf ball-sized metal cylinder at the heart of the world&apos;s system for measuring mass is heading into retirement. 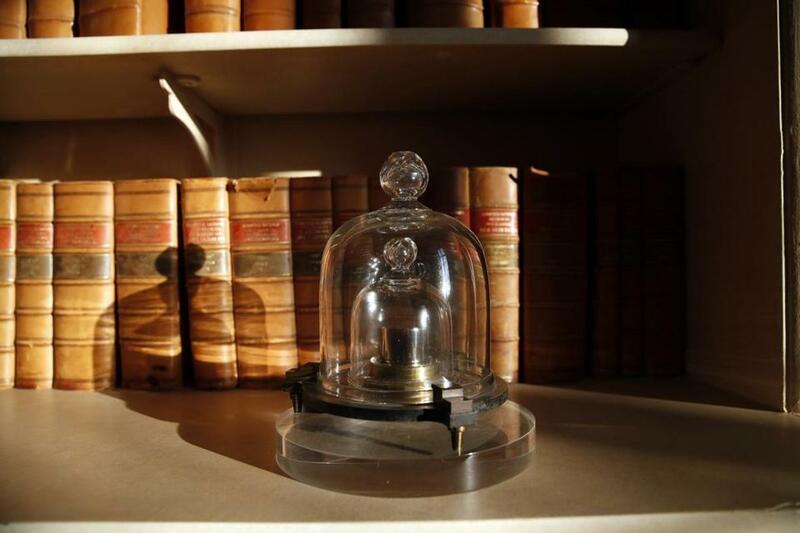 SEVRES, France (AP) — The kilogram is getting an update. No, your bathroom scales won’t suddenly become kinder and a kilo of fruit will still weigh a kilo. But the way scientists define the exact mass of a kilogram is about to change. Of the seven, the kilo is the last still based on a physical artefact, the Grand K. The meter, for example, used to be a meter-long metal bar but is now defined as the length that light travels in a vacuum in 1/299,792,458th of a second. Only exceedingly rarely, and exceedingly carefully, have the BIPM’s master kilos been gingerly taken out so that other kilos sent back to Sevres from around the world could be compared against them, to be sure they were still properly calibrated, give or take the mass of a dust particle or two. Although many Americans commonly think of weight in pounds and ounces, the United States is officially a kilo country, too: It was one of the original 17 founders of the BIPM in 1875. The United States’ primary kilo is called K20 and was assigned to the country in 1889 by the BIPM, along with another, K4. One kilo is equivalent to 2.2 pounds. The U.S. also has six other platinum-iridium kilos: K79, 85, 92, 102, 104 and 105. They are all looked after by the National Institute of Standards and Technology, a branch of the U.S. Commerce Department. To verify their mass, K20 and other kilos from around three dozen other countries were measured in Sevres against the BIPM’s master kilos in a painstaking calibration exercise from 1988 to 1992. K20 was most recently then measured again at the BIPM in 2014. Even as humans argued, fought and slaughtered each other by the tens of millions in the 20th century, they shared the kilo. The kilo allocated to China in 1983, as it started to embrace market reforms that subsequently turned it into an economic behemoth, was the first manufactured with ultra-high precision diamond machining. Allocated to Japan in 1894, K39 was later ceded to South Korea in 1958. The metal kilo is being replaced by a definition based on Planck’s constant, which is part of one of the most celebrated equations in physics but also devilishly difficult to explain . Suffice to say that the update should, in time, spare nations the need to occasionally send their kilos back to Sevres for calibration against the Grand K. Scientists instead should be able to accurately calculate an exact kilo, without having to measure one precious lump of metal against another. Milton says the change will have applications in computing, manufacturing, pharmaceuticals, the study of climate change and other sciences where precise measurements are required.